Nah, too much work. Next time we meet, I'm likely to just use a Jedi mindtrick and give you my keys instead! I've been waiting for almost a year to find a Dragon that was in good shape and this one is excellent. I've been waiting for almost a year to find a Dragon that was in good shape and this one is excellent. I really like the logo on the inside of the doors. If you want more of those same polish aluminium decals you have on the doors let me know. The one on the driver door is showing some wear and I would love to replace it and possibly have an extra. What's it take to hook me up? 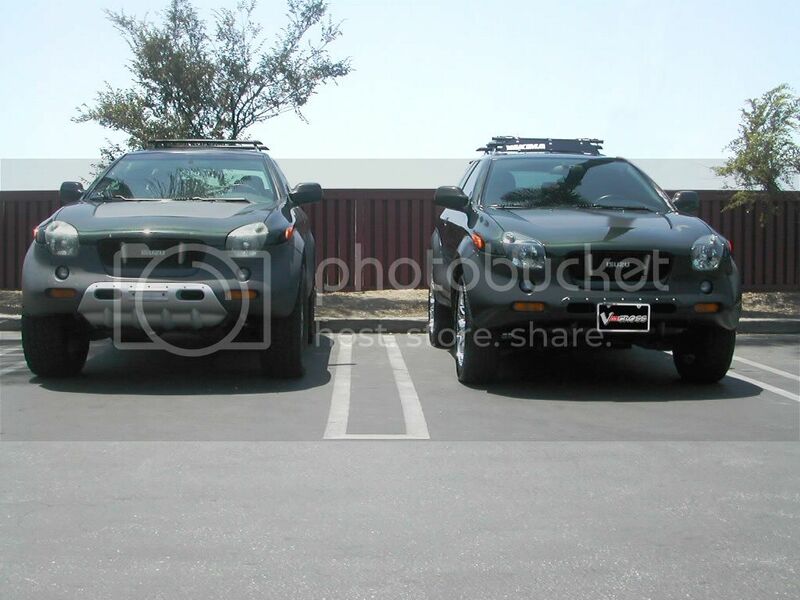 Grandpa Bob's Supercharged Dragon at the LA VX Meet 11-9-02 on the steps of Isuzu's Headquarters. Blasting past the big boys stuck in the 8 inches of mud at the Nascar races last weekend! Avis just dumped my reservation for a Caddy and substituted a Mustang. I am going to pick up my new 01 Dragon with 25,000 miles on her. Sure hope I like it! I think Frog11 was the previous owner. Great guy & great VX. You're gonna love it. I bought my VX with around the same number of miles from a guy in northern Virginia too. I had a ****-eating grin on my face the whole way home. I sure hope you don't like it...I hope you LOVE it as much as others here and smile, not only all the way back home, but for many years to come. I want a dragon lol I have been keeping my eye out for a low mile one, but maybe ill have to settle? Don't give up, it'll be worth the wait! What would you rather have, the instant gratification of buying another color that pops up nearby, or the satisfaction of having worked hard to get EXACTLY what you want? I think H3_VX posted that a friend saw a Dragon for sale in PA. Who knows, maybe he could take a look for you? I know that's a long way, but just like Foxfires, Dragons are really rare - as in less than 230 in the whole country.